The blue vegetable group is more accurately called the blue-purple or red-purple group because the same phytochemical creates shades or red, blue and purple. Only a few vegetables naturally belong to the blue group, but you can find a variety of specialty vegetables on the market, usually in hues of purple, which were bred to boost beneficial antioxidants. All of the vegetables in the blue-purple group contain phytochemicals called anthocyanins. Anthocyanins are pigments responsible for red, blue and purple colors, but they’re also biologically active as antioxidants. Because the blue group includes more fruits than vegetables, much of the research to date is based on anthocyanins extracted from fruit. Laboratory studies cited on the Pennington Biomedical Research Center website show that they may help keep blood vessels healthy, improve vision and inhibit the growth of cancer. Anthocyanins are water-soluble, so use a small amount of water when you cook these vegetables to minimize nutrient loss. Purple-skinned varieties of eggplant contain anthocyanins, but only in the skin. To gain the most nutrients, buy smaller-sized eggplants because their skin is more tender and edible than large eggplants. Even if you discard the skin, you’ll still get other antioxidant phytochemicals from the flesh. An abundant phytochemical found in the flesh -- chlorogenic acid -- is one of the most powerful antioxidants produced by plants, according to the U.S. Department of Agriculture. When you eat eggplant, you’ll also gain dietary fiber, thiamin and vitamin B-6. You may find varying shades of purple and red in cabbages because the hue changes depending on levels of acidity. 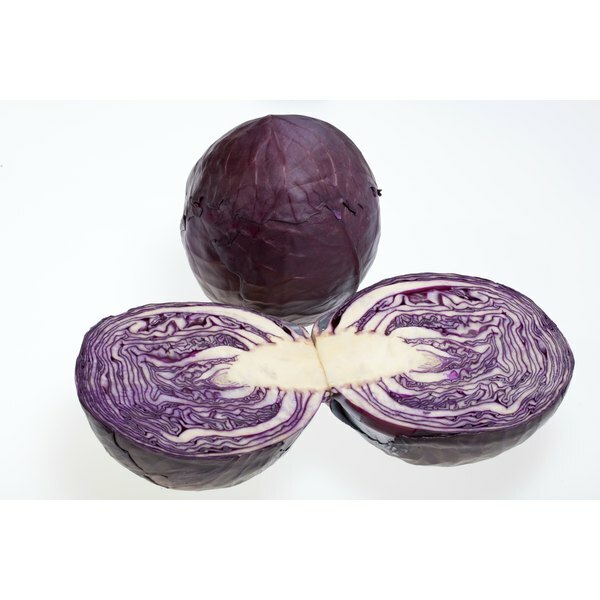 Even when it's purple, this type of cabbage is commonly called red cabbage. Red cabbage is a rich source of vitamin A, compared to green cabbage, which has barely a trace of the vitamin. Red varieties also have about 1.5 times more iron and vitamin C than their green counterparts. Purple cabbage contains sulfur-containing substances found only in cruciferous vegetables, which may help prevent some forms of cancer, reports the Linus Pauling Institute. How Much Potassium Is in Bitter Gourd?